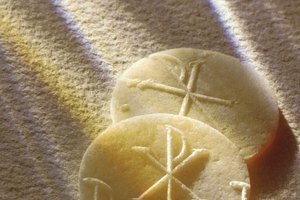 The bread used in the Eucharist is typically in the form of flat, embossed wafers called hosts. The sacraments of the Roman Catholic Church are sacred ceremonies of blessing and initiation, performed by an ordained priest according to the canons of church doctrine. First Communion is the introduction of a sacrament referred to as the Eucharist or Communion. 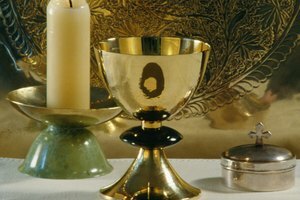 The church describes the Eucharist as bread and wine which has been transfigured into the body and blood of Jesus Christ. After a Catholic receives First Communion, repeated participation in the sacrament becomes a lifelong privilege. The prerequisite to the other six Catholic sacraments, including Communion, is Baptism, the ritual anointment and blessing that welcomes a child or convert to membership in the church and wipes away original sin. Catholics believe that the legacy of Adam and Eve's sin, their disobedience of God's command in the Garden of Eden, shadows every soul until it is baptized. Baptism absolves the sin and connects the soul to the grace of redemption bestowed by Christ's sacrificial death on the cross. It is customary to baptize an infant within days or weeks of its birth; adults are baptized after completing a course of instruction to familiarize them with the beliefs, commandments and practices of the faith. In the early days of the Catholic Church, infants were baptized and received Communion at the same time. This practice is no longer followed -- children must have attained the age of reason before receiving their First Communion. The decision about a child's ability to understand the sacrament and its significance, rests with the parents and the child's confessor or parish priest. Typically, children are prepared for First Communion at around age seven, when they are in second grade. They spend a year studying the catechism of the church and learning about the life of Christ and the Last Supper, where he blessed bread and wine, transfigured it into his own body and blood, gave it to his disciples to eat and drink, and commanded them to continue the practice in his memory. First Communion is preceded by the sacrament of Penance, also known as Confession or Reconciliation. Penance clears the soul of wrongdoing that has occurred since Baptism and prepares it to receive the gift of Christ's body and blood. The Catholic recites the Act of Confession, a prayer which is a declaration of contrition and faith, and then confesses his or her sins to the priest who administers a penalty and absolution. The penalty, or penance, is usually prayer but it may also involve restitution or some other action, depending on the severity of the sin. For a child, the sacrament of Penance is a lesson to be mindful of daily conduct and sincerely contrite for breaking the commandments, placing the soul in jeopardy. Catholics believe that a soul cannot enter heaven with unforgiven sins. First Communion is a great celebration that takes place within the Catholic Mass and involves the communicant, the family and the participation of the entire church. Children usually wear white, dressy clothes to signify purity. All communicants must have completed their catechism study, confessed their sins and abstained from food and drink for one hour before receiving the Eucharist. A special section of the church is reserved for a young First Communion class, the altar is decorated with flowers and the sermon is directed to them. The sacrament is usually scheduled around Easter time, the holiest season of the year in the church. Adult converts to Catholicism will have completed the Rite of Christian Initiation of Adults, professed their faith and demonstrated familiarity with church teachings before receiving Communion for the first time. Crawford, Benna. "Requirements for Catholic First Communion." Synonym, https://classroom.synonym.com/requirements-for-catholic-first-communion-12086343.html. 29 September 2017.